Franz Schubert was a merry man who enjoyed not only his work as a composer and music performer, but also a good laugh with friends, drink in fun company and the odd shag. The latter one ultimately caused his death - syphilis is still a nasty STD, but in the 19th century, it often killed you. The stories of Schubert′s affairs are legend and it is not the purpose of this article to evaluate his love life. But there is one sightseeing attraction in central Vienna that requires this dodgy introduction: The "Dreimäderlhaus" or "House of Three Girls" near the Vienna University. This tiny building is situated on the Mölkerbastei bastion, one of the very few remains of Vienna′s city walls. Right next to the Pasqualatihouse, where Ludwig van Beethoven lived for a few years. The Pasqualatis were rich Viennese burghers from the late Classical age and accommodated the eccentric Beethoven - here he wrote his only opera, "Fideolio". 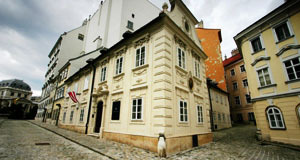 Today, it contains a side-branch of the Wien Museum, one of the "Musikerwohnungen". Next doors, the Dreimäderlhaus is a particularly fine example for architecture of the Biedermeier Age, the period approximately between 1800 and 1850, which is not dissimilar from the British Regency. Legend has it that once the Dreimäderlhaus was inhabited by a wealthy merchant and his three beautiful daughters and that young Franz Schubert fell in love with the prettiest one. In another version, he did all three of them. In fact, there is no evidence that Franz Schubert ever entered the house at all. Nevertheless, the later composer Heinrich Bertes used the story of Schubert and the beautiful girl (the first version, which proved to be more accessible for a mass audience) as a base for a romantic and comic operetta called "Dreimäderlhaus". If you like the Biedermeier architecture of the building, do go to the Spittelberg area - here you find an entire neighbourhood in this style, filled with cosy restaurants, independent art theatres, shops and galleries. If you want to learn more on Schubert, see my article on the "Musikerwohnungen" or composer′s flats, or read the article on the transformation of Classical music into the composition of the Romantic Age. For attractions nearby the Dreimäderlhaus, try the Burgtheater, the Main Uni, the Freyung and the Schottenstift, but also the Votivkirche and the Rathaus, the BA-CA Kunstforum and the Palais Ferstel. It is very centrally located, so finding things worth seeing shouldn′t be a problem. If you prefer to use a tram, a stop is just down Ringstraße - ideal for exploring the rest of the boulevard.